In January Greenplum rolled out a new query optimizer. This is very cool and very advanced stuff. Query optimization is a search problem… in a perfect world you would search through the space of all possible plans for any query and choose the least expensive plan. But the time required to iterate through all possible plans would take more time than most queries… so optimizers use rules to cut down the space searched. The rules have been built up over the years and are designed to prune the space quickly to keep performance high for simple queries. But these rules can break down when complex queries are introduced… so Greenplum made the significant investment to build a new optimizer from scratch. Florian Waas, the leader of this program for Greenplum (now off on another venture) explained it to me this way. 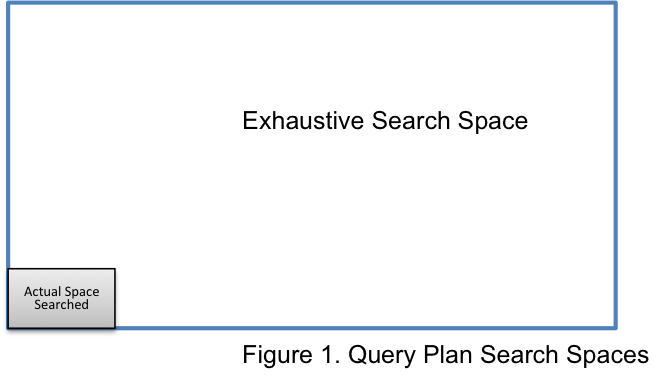 If the large rectangle in Figure 1 represents the total search space for a query, a modern query optimizer only searches the area in the small gray square… it looks for the best plan in that small space. You may be surprised to learn that the optimizers used by every major DBMS product are single-threaded… they use only one core of a multi-core processor to search the space and produce a plan. There is no way to effectively search more with a faster single processor (even though you could search more the amount of time you spend as a percentage of the query execution time would stay the same… because the query execution would speed up as well)… so if the optimizer is to search more of the space it will have to use multiple cores and search the space in parallel… and this is exactly what Greenplum has accomplished. The benchmark results for this are impressive (see here)… several queries in the TPC-DS suite run hundreds of times faster. ORCA is available to early support customers now and the results map to the benchmark… some queries see an extreme performance boost, while others run significantly slower. This is to be expected from any first release optimizer. But Greenplum have built another advanced technology into ORCA to reduce the time it will take to mature the software. ORCA includes AMPERe, an optimizer debugging facility that captures the state necessary to recreate problems and fix them. Together these capabilities: parallel search and specialized debugging have advanced the state of the art significantly. What does it mean to you? It will take some time to shake out ORCA… and HAWQ is still very slow when compared to other analytic databases… and very very slow when compared to the in-memory databases available… and in-memory products like Spark are coming to the Hadoop eco-system. But at the price point HAWQ is a bargain. If you need an inexpensive batch engine that crunches numbers offline then in the next year, as ORCA matures, it may be worth a look. As a side note… this topic introduces one of the issues related to in-memory databases… when even a very complex query completes with a sub-optimal plan in under a second how much time can you spend searching the plan space? I suspect that applying the parallel optimization principles developed by the Greenplum team will yield similar or even better improvements for in-memory… and these techniques will be a requirement very soon in that space.